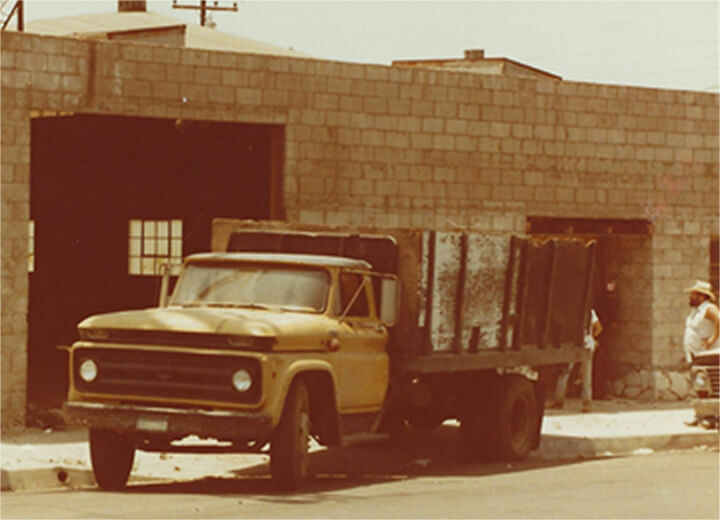 Frank Martin and Robert “Bob” Brattrud join forces to establish Martin Brattrud on Western Avenue in Torrance, California. Initially a modest furniture framing shop, Martin Brattrud quickly evolves to manufacture a variety of high-quality residential upholstered furniture. 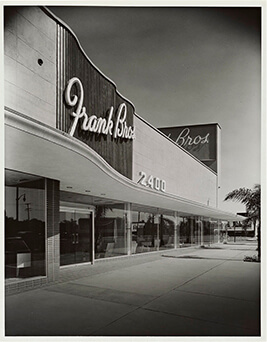 Martin Brattrud can be found at the world‑renowned Frank Bros. furniture store in Long Beach, CA. 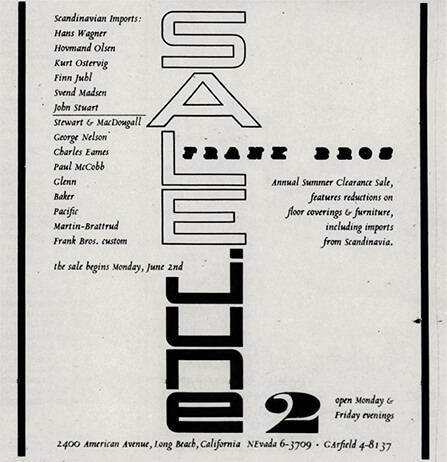 Advertisement from Arts & Architecture magazine, July 1949. 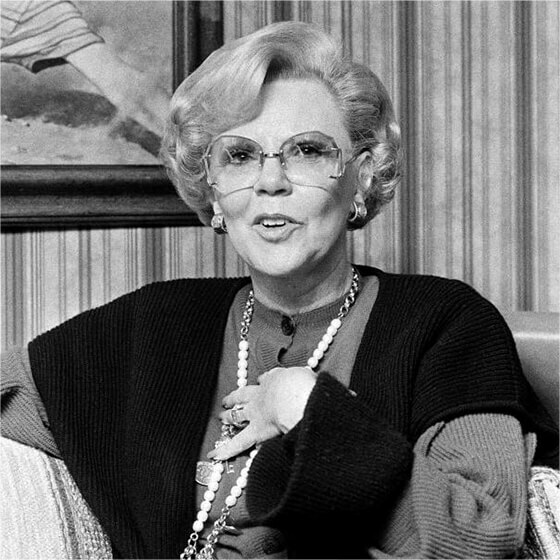 Advertisement from Los Angeles Times. Martin Brattrud collaborates with notable modernist designers like Greta Magnusson Grossman and Milo Baughman. Interior design firms such as Cannell & Chaffin commission Martin Brattrud to manufacture custom furniture as well as entire product lines. Greta Magnusson Grossman designs the “Palisades Group” for Martin Brattrud. The “Wilshire Group” would follow in 1952. 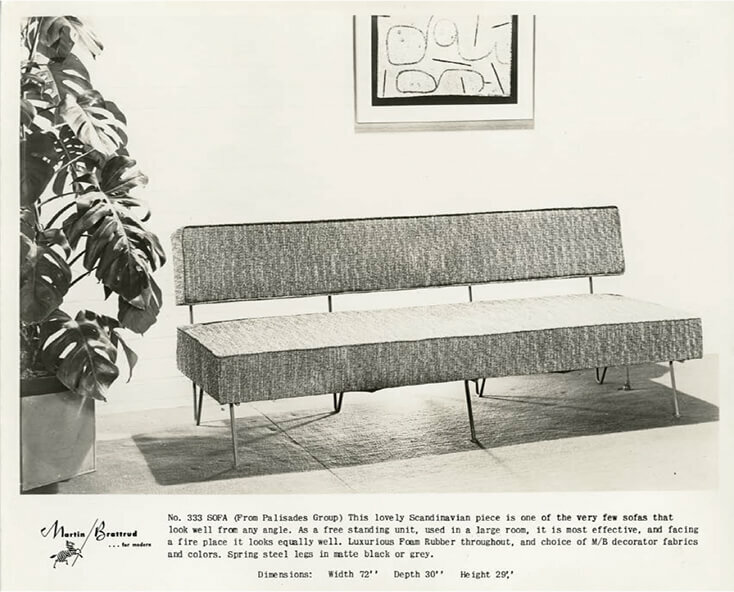 Catalog Sheet for the 333 Sofa from the Palisades Group. “Palisades Group” Lounge Chair. Photograph by Donald J. Higgins. 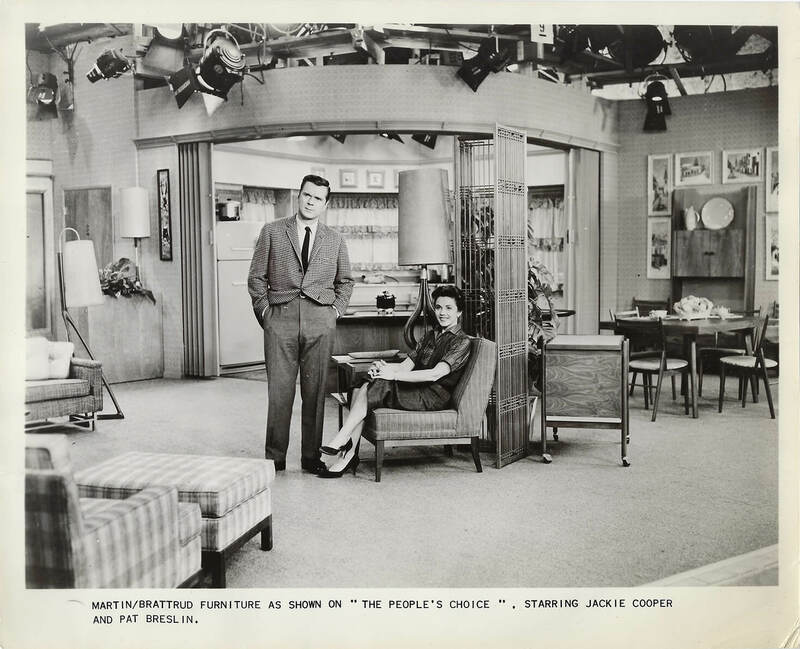 Jackie Cooper and Pat Breslin enjoy Martin Brattrud funiture on the set of “The People’s Choice”. Southern California emerges as an important site for progressive residential and commercial architecture. Prominent modernist architects leave an indelible mark on the landscape of Los Angeles and Palm Springs, creating notable structures often furnished with custom furniture by Martin Brattrud. 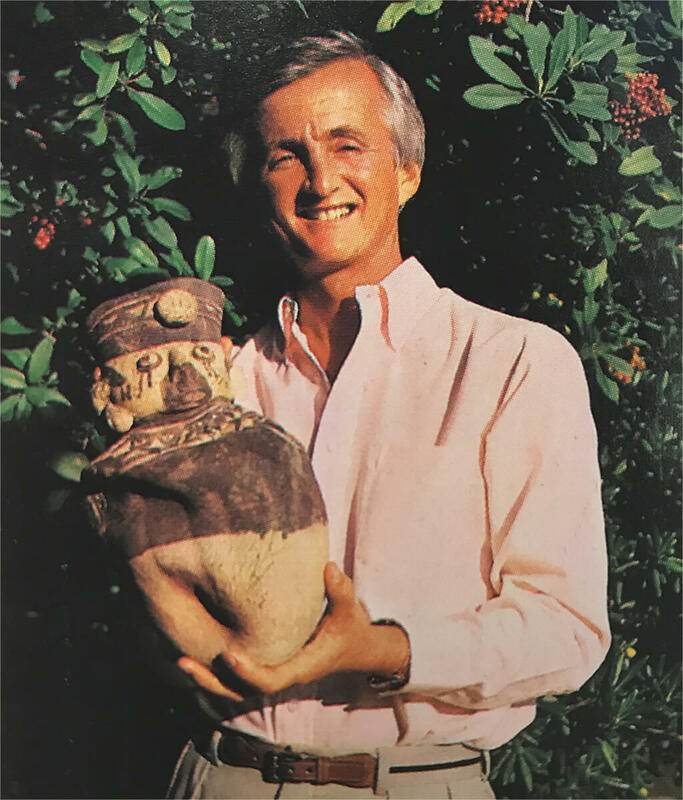 Launching his Palm Springs-based firm in 1954, Arthur Elrod would go on to hire iconic designers including William Raiser and Steve Chase. 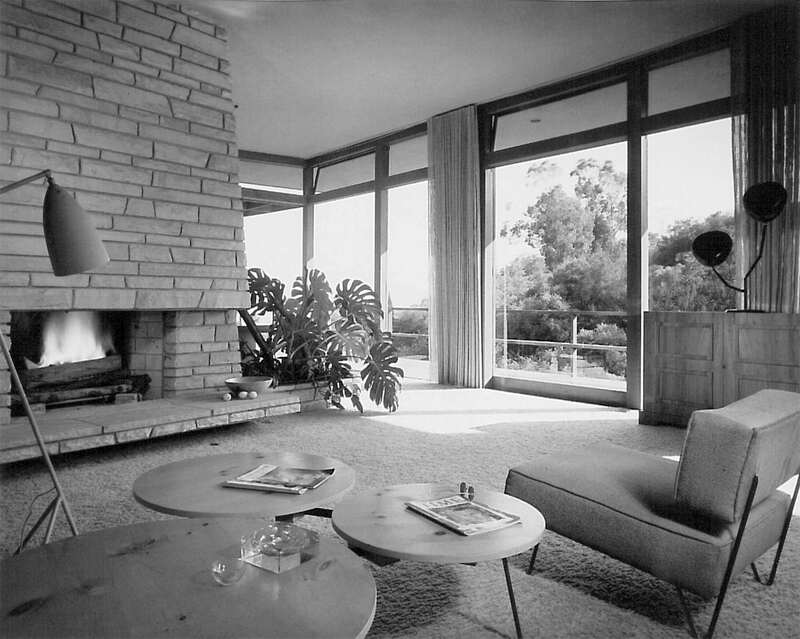 Arthur Elrod and Associates is responsible for the interior design of many of the most celebrated Palm Springs midcentury homes. 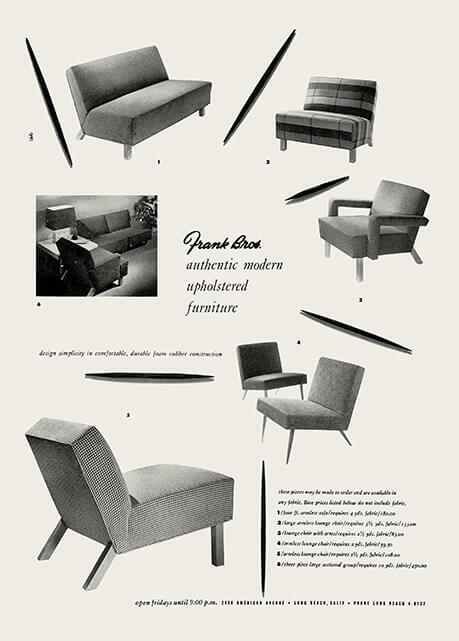 Elrod enlisted Martin Brattrud to manufacture many of his upholstered designs. 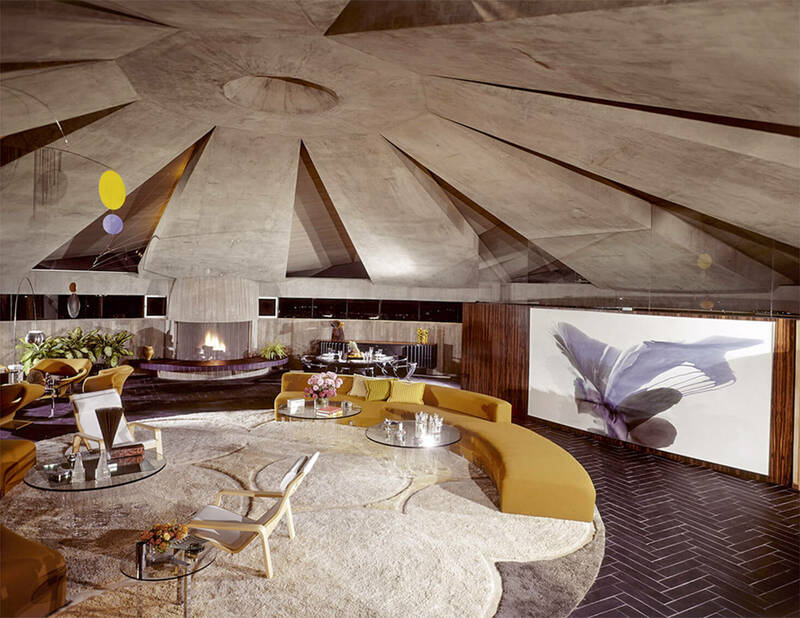 Martin Brattrud creates furniture for Arthur Elrod’s own Palm Springs residence, designed by architect John Lautner. 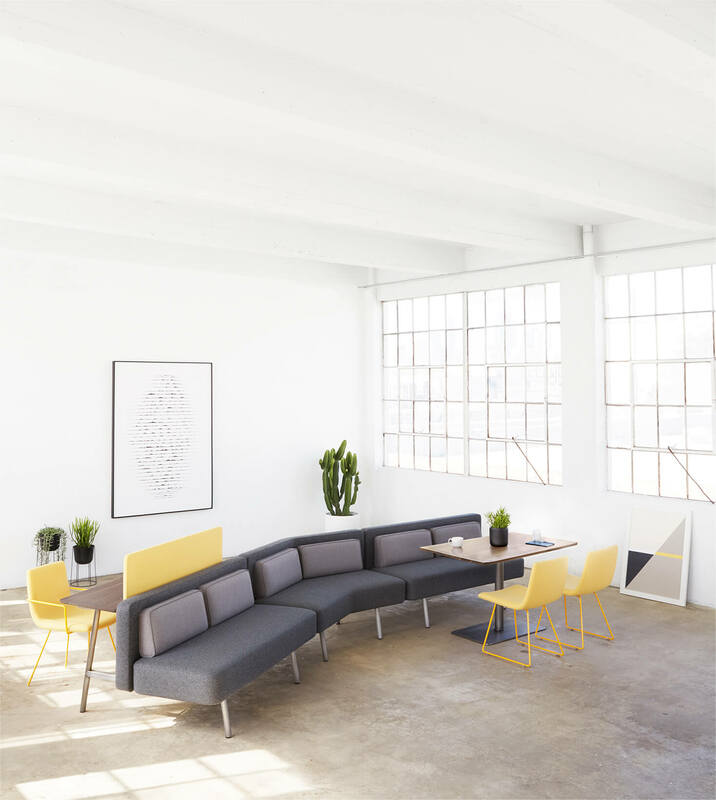 Pieces include this custom 28’ arced sofa and an opposing bench. Photograph by Leland Y. Lee. The Elrod house is featured in the 1971 James Bond film “Diamonds Are Forever”. Bambi and Thumber scene from “Diamonds Are Forever”, 1971. 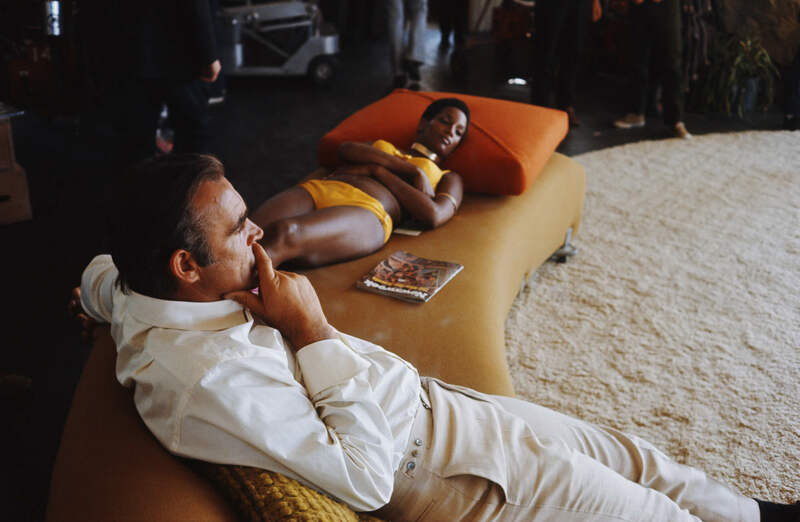 Sean Connery and Trina Parks on set for the filming of “Diamonds Are Forever”. 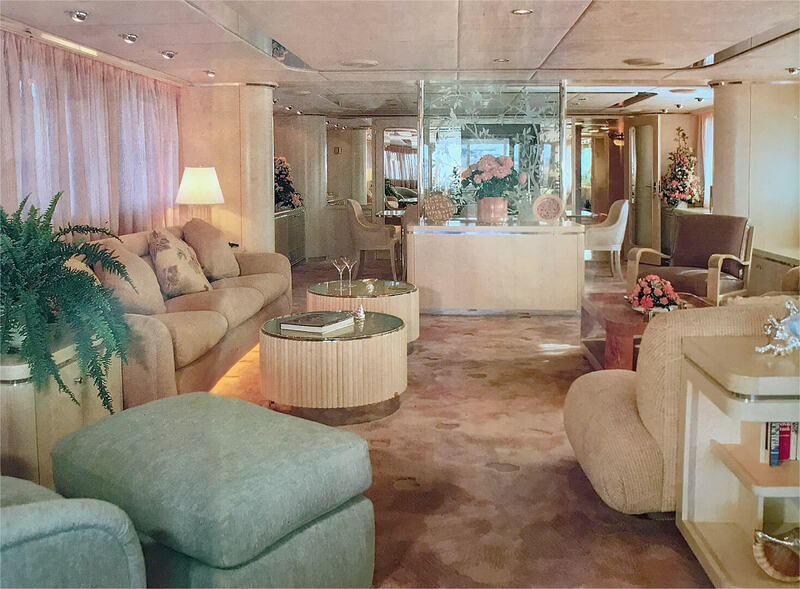 Throughout the 70’s and 80’s, acclaimed interior designer Steve Chase commissions Martin Brattrud to make custom furniture destined for the stylish Palm Springs homes of numerous Hollywood celebrities as well other projects including yachts and museums. 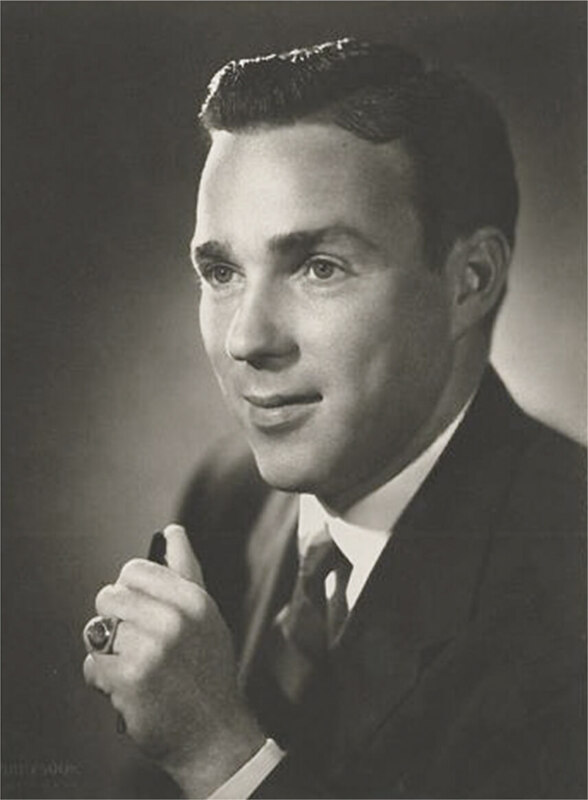 Steve Chase joined Arthur Elrod and Associates in 1967 and continued to work with the firm for 14 years before launching his own namesake firm. 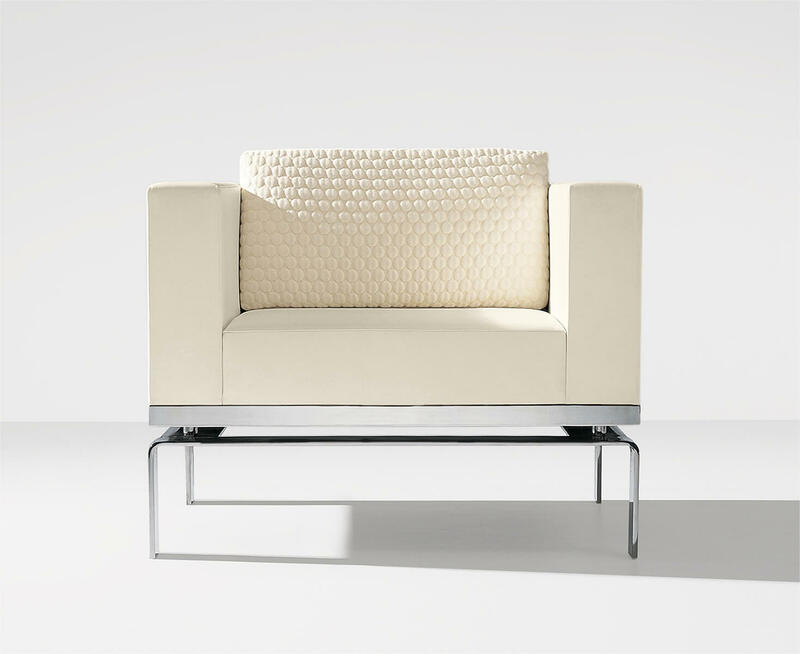 Steve relied on Martin Brattrud to manufacture many of his custom upholstered pieces as well his own signature line of upholstered furniture. 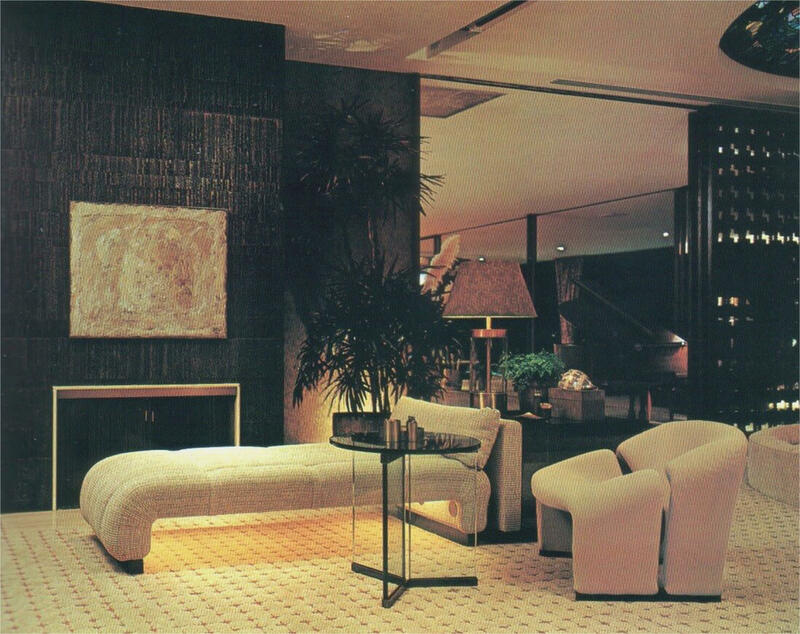 A Chase-designed chaise lounge with channel tufting and integrated underlighting foreshadows a design language that would become a Steve Chase signature throughout the 1980’s. Following the retirement of Robert Brattrud, Allan G. Stratford purchases and becomes President of Martin Brattrud. The company moves to larger premises in Torrance. “Deliberate, unexpected and with touch of humor” – Steve’s own words to describe his design aesthetic. This daybed is a perfect example, featuring his signature rounded form, plush upholstery with channel tufting, and underlighting. Martin Brattrud begins to build a presence in the contract market, creating alliances with Gensler, Interior Architects, HOK, and other major architectural firms. 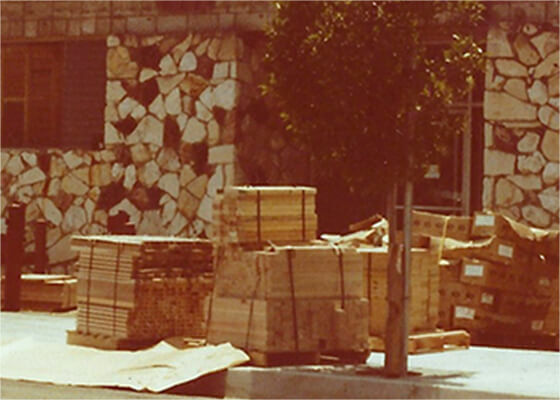 In 1982 Martin Brattrud moves to its current location in Gardena, expanding its facilities to 37,000 square feet. 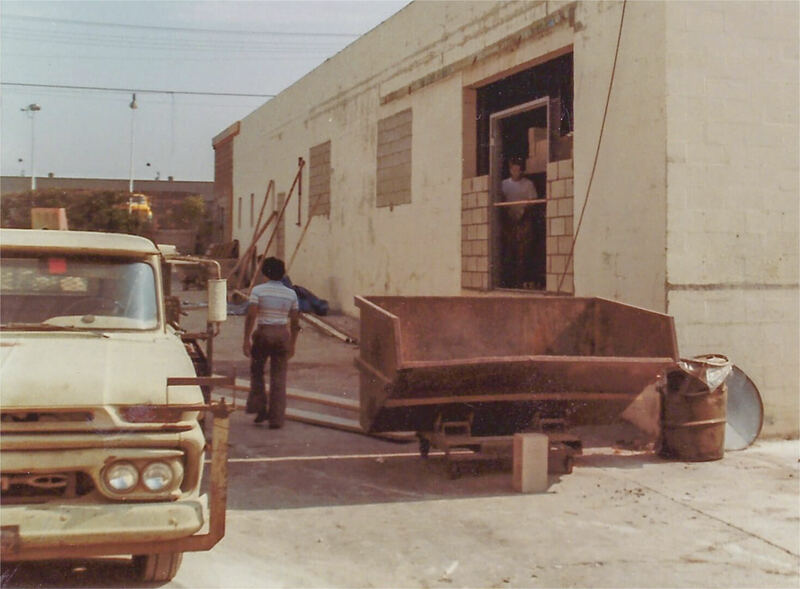 Construction of the current facilities including the frame shop, upholstery shop, and finishing areas in Gardena, 1982. 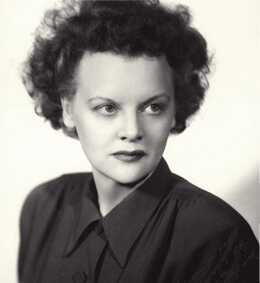 Pat Baxter joins the company. As VP of Marketing, Pat will oversee the repositioning of Martin Brattrud from a regional residential manufacturuer to a nationally recognized contract brand. 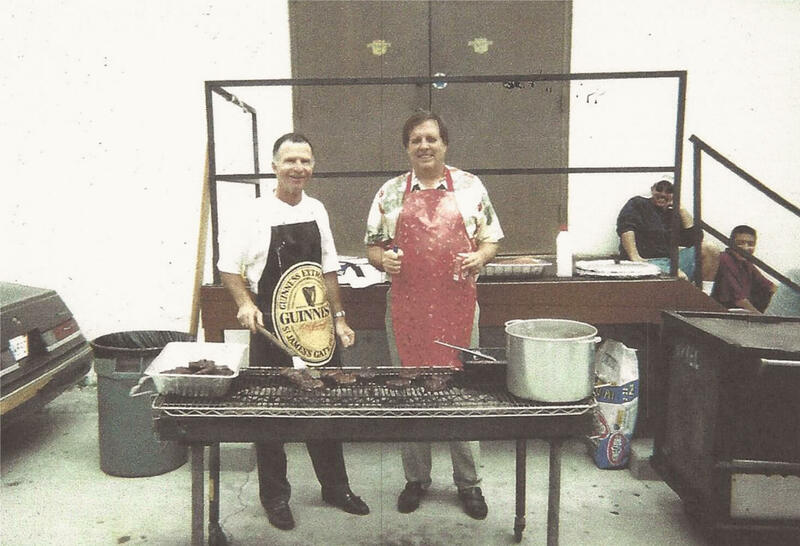 Pat and Allan serve up some BBQ for the team. 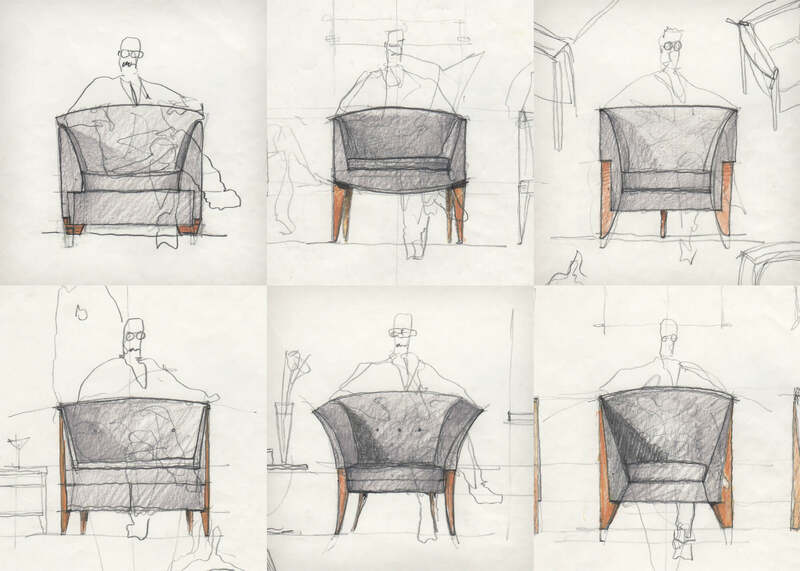 Sketches from designer Brian Graham for his first of many projects with Martin Brattrud, circa 1986. 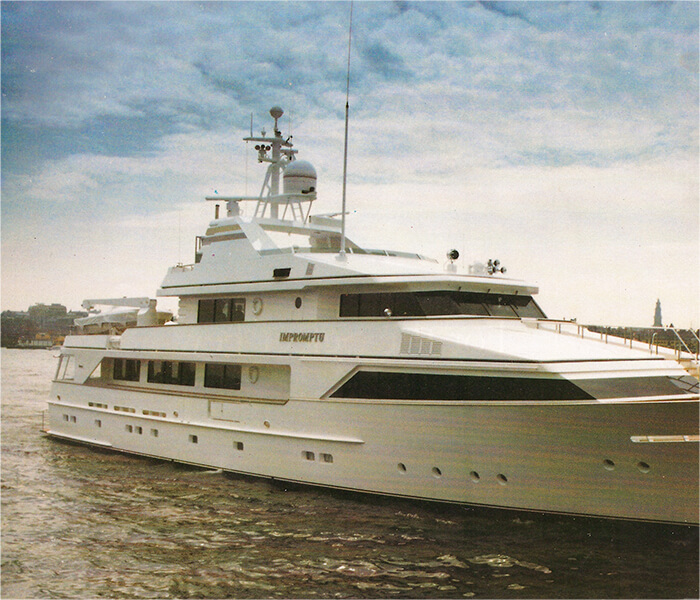 “Cool, open, and decidedly feminine” – the yacht of philanthropist Joan Kroc, named Impromptu, featured interiors by Steve Chase and custom seating throughout by Martin Brattrud. 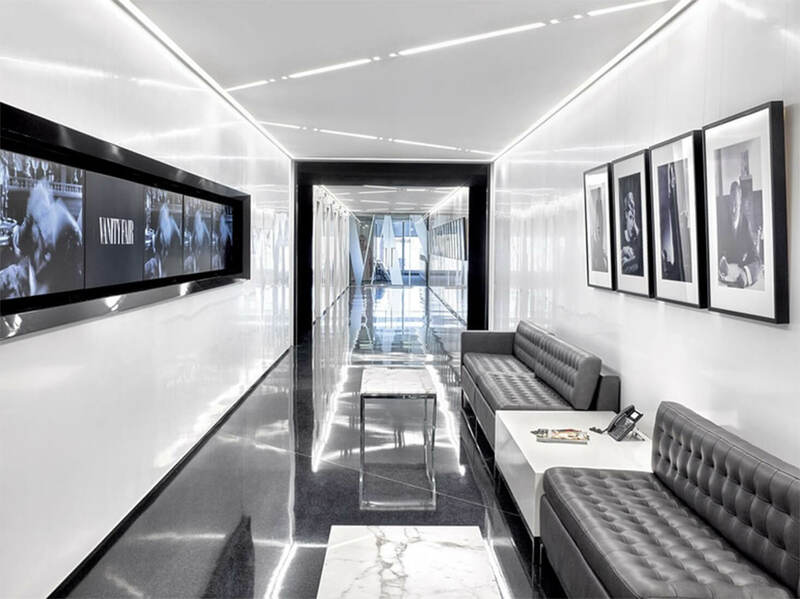 Martin Brattrud becomes a more diversified manufacturer, creating furniture for corporate offices, sports and entertainment facilities, restaurants and hotels. 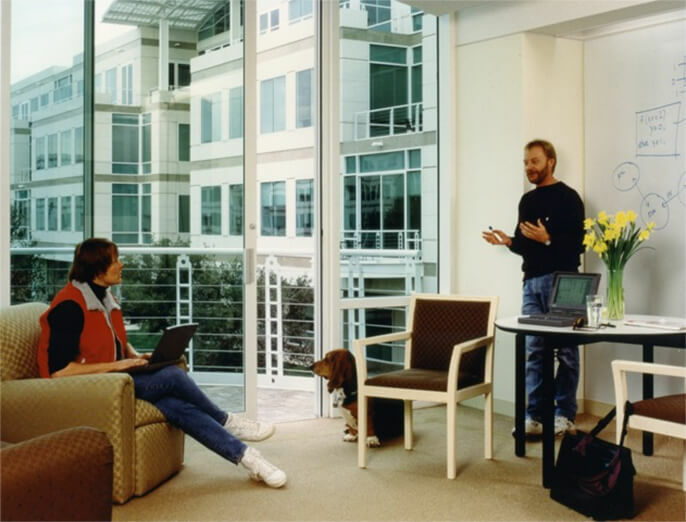 Martin Brattrud gets specified throughout Apple’s first iteration of its Infinite Loop Campus in Cupertino, California. This paves the way for future large-scale installations and cements Martin Brattrud’s position as a highly-regarded contract manufacturer for product designers and specifiers alike. 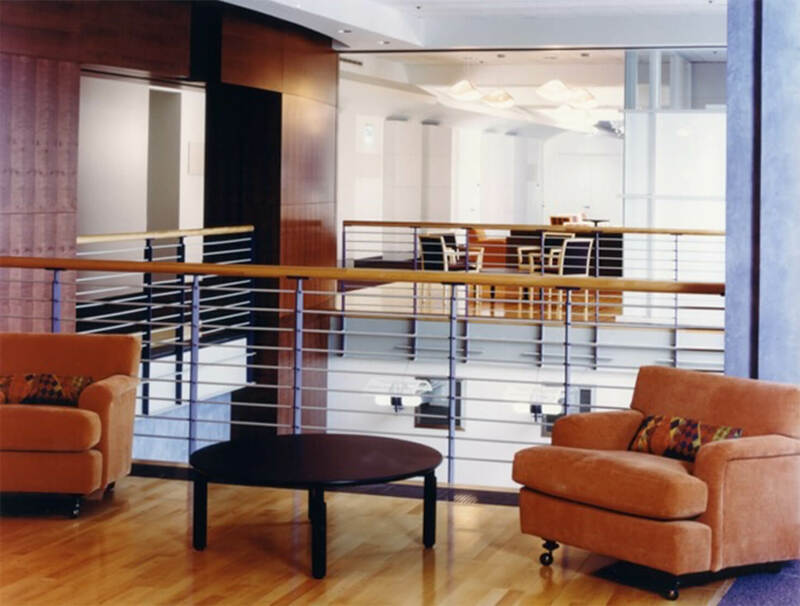 Shown: Maidstone lounge chairs and Spyglass side chairs. Designed for Martin Brattrud by architect Mark Marcinek, the Think Fast Lounge Chair makes its debut at Pacific Design Center. 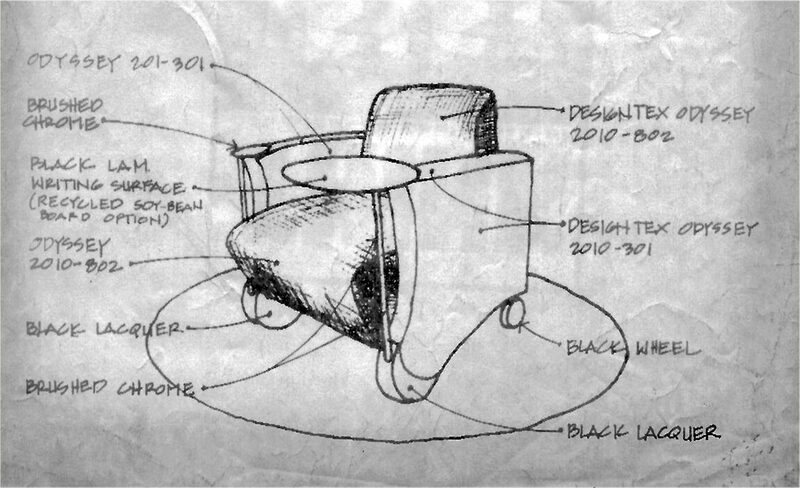 The chair’s design features a tablet arm—a timely innovation that parallels the advent of laptop computers. 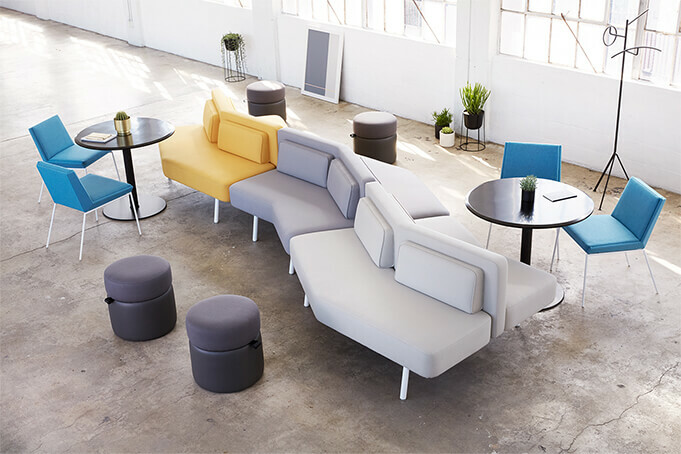 Back wheels offer mobility, anticipating an era of fluid, flexible workspaces still in play today. 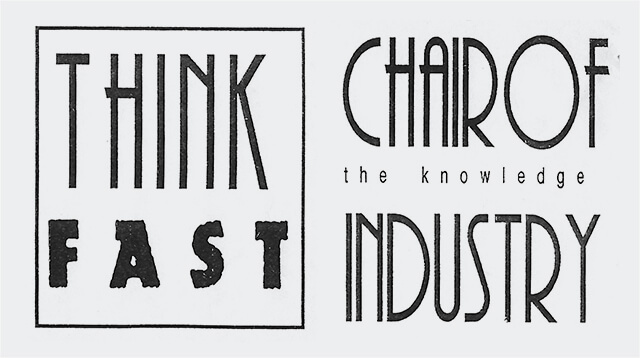 The Think Fast chair becomes a best-seller within 5 months and remains its best selling chair for 5 years. 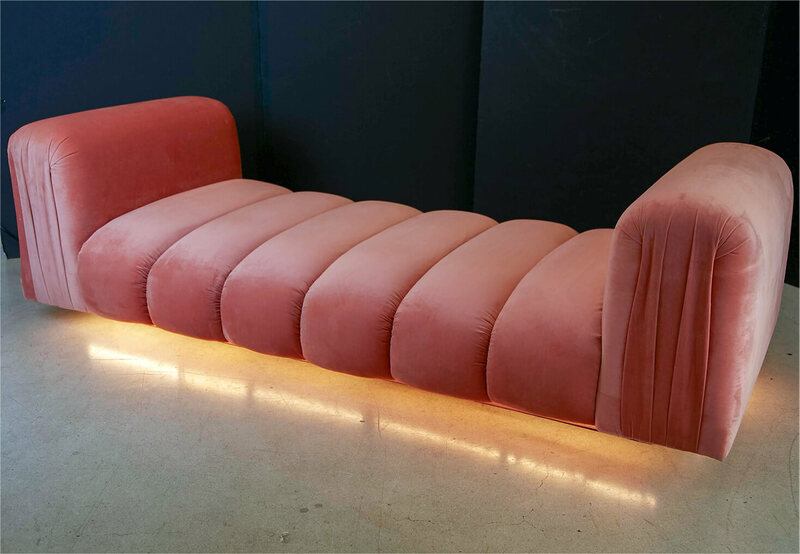 Martin Brattrud gets specified by AREA Architecture to create a range of whimsical upholstered seating pieces for the Nickelodeon corporate headquarters. Shown: Custom upholstered lounge chairs and Splat ottoman. All Martin Brattrud furniture continues to be handmade in the USA. In response to continued growth and the need for additional square feet of manufacturing space, an additional facility on Western Avenue in Gardena is leased and subsequently purchased. 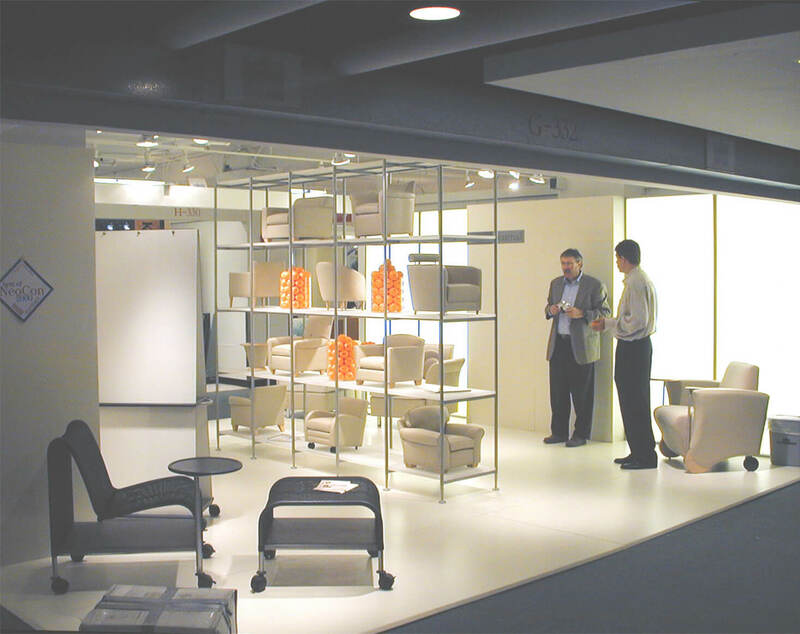 Martin Brattrud makes its first appearance at NeoCon, further increasing exposure to the contract market. 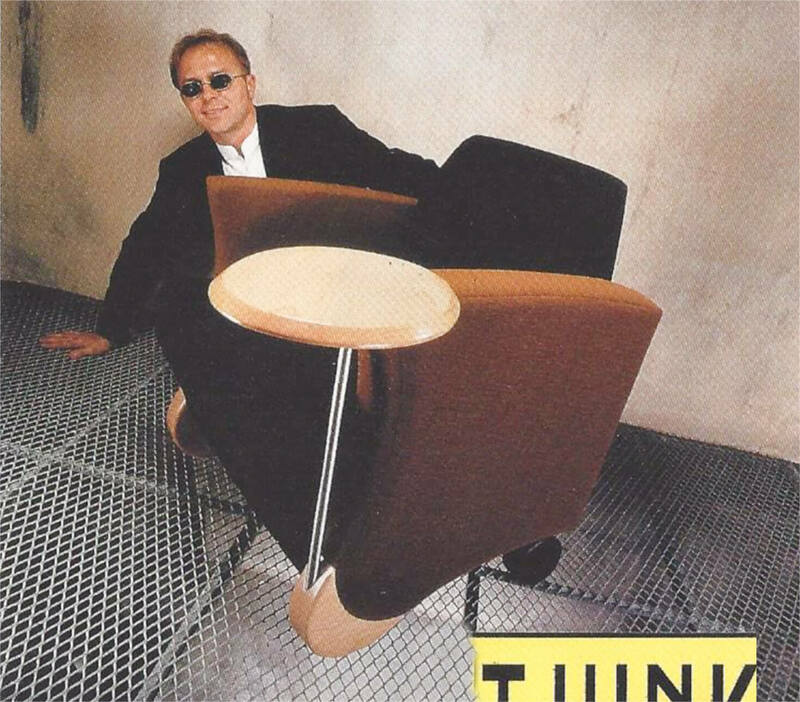 Shown: Martin Brattrud 1/3 scale lounge chair models and the Think Fast tablet chair. Martin Brattrud releases the One Collection, designed by Collin Burry and Terry Walker. 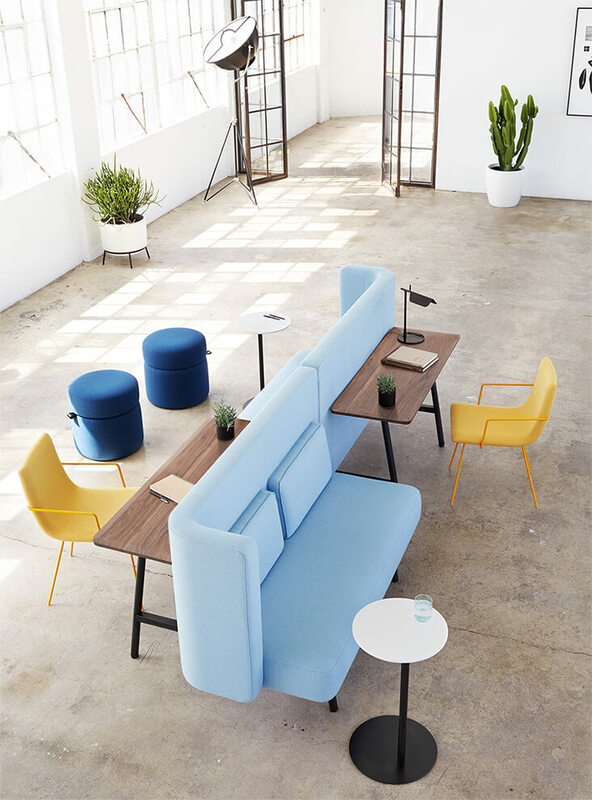 Characterized by its iconic mix of precision and comfort, upholstered pieces rest on a sleek platform that gives the furniture its distinctive light, floating presence. 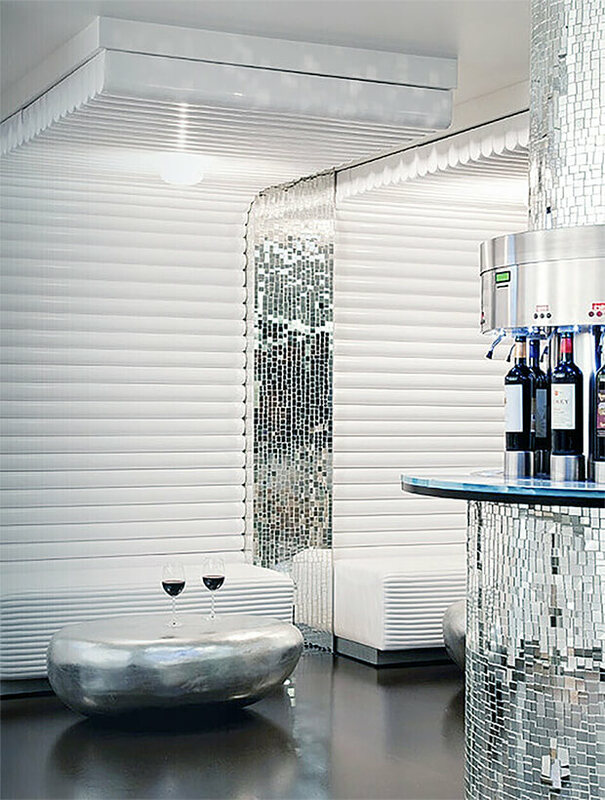 Today, the One Collection remains an iconic design often specified for the upscale lounge. 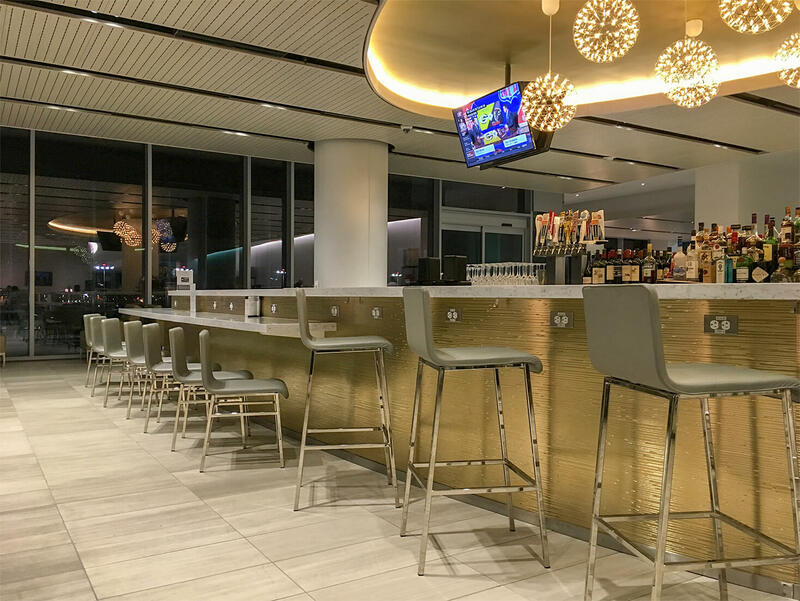 HKS specifies Martin Brattrud products and custom banquette seating for many areas of the award-winning Dallas Cowboys AT&T Stadium, including the Player’s Lounge, the Champagne Bar, and the VIP Terrance. 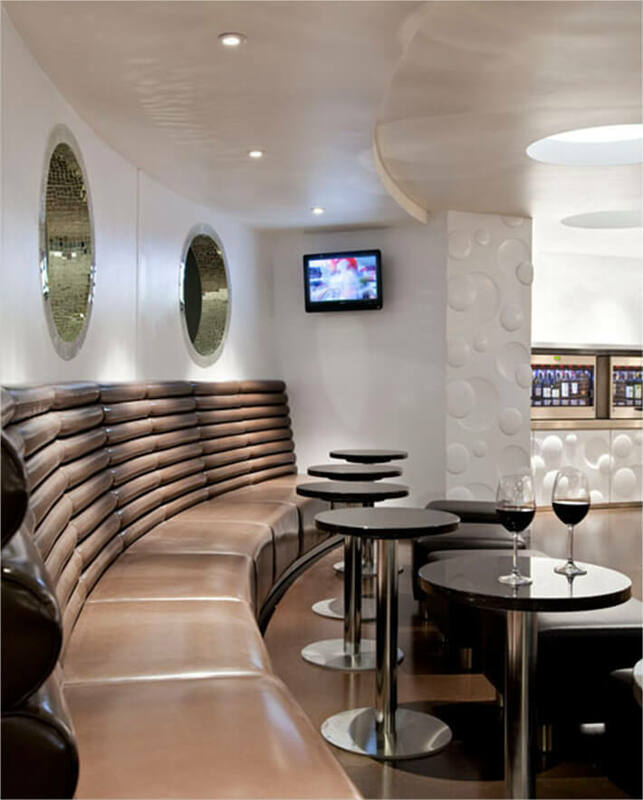 Shown: Delaney Stools on the VIP Terrace and custom banquette seating in the Bubbly Bar. An impressive roster of accomplished, award-winning designers now contribute to the Martin Brattrud portfolio. 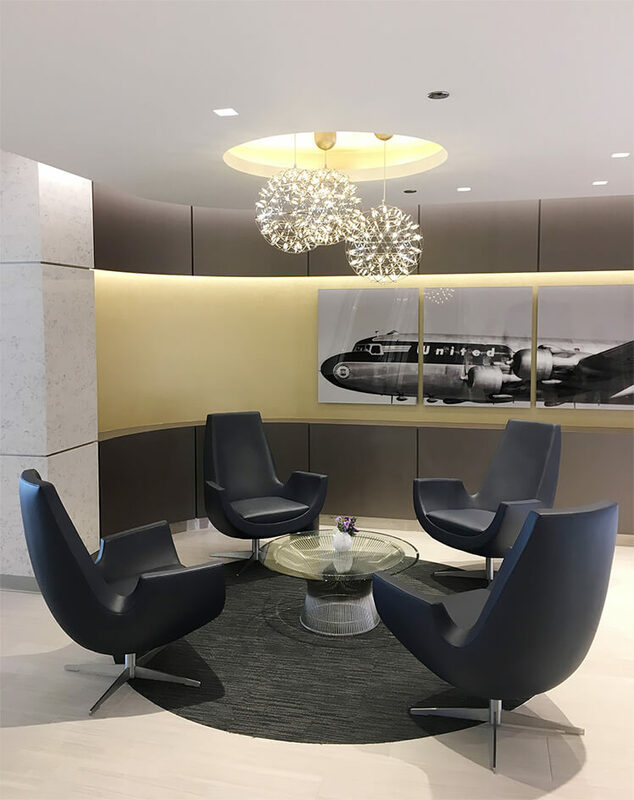 Well-established in the contract market, Martin Brattrud takes on projects of larger scale while retaining local manufacturing, competitive lead times, and the highest quality product. 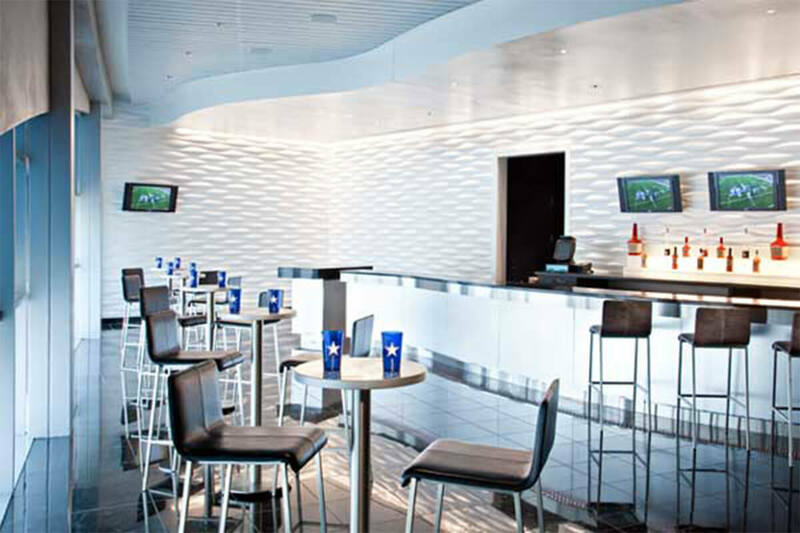 Martin Brattrud is specified by Interior Architects for seating within United Club Lounges at multiple airports. 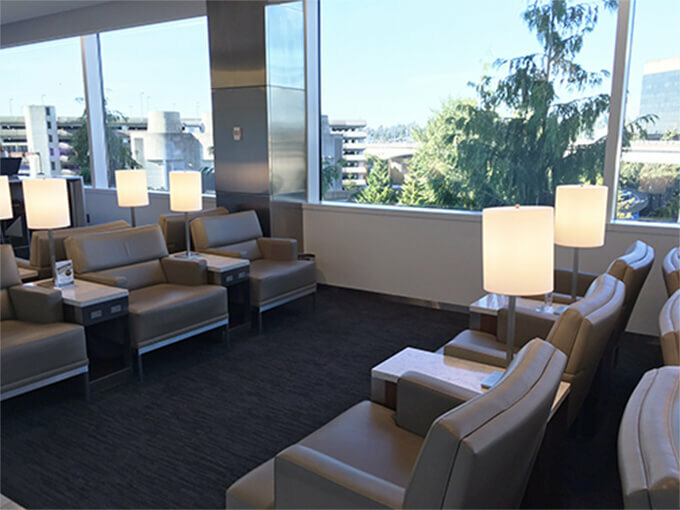 Shown: Braemar lounge chairs, Kurve lounge chairs, and Delaney stools. Martin Brattrud becomes an ESOP (employee stock ownership plan) company, allowing for all employees to have an ownership stake in the company. 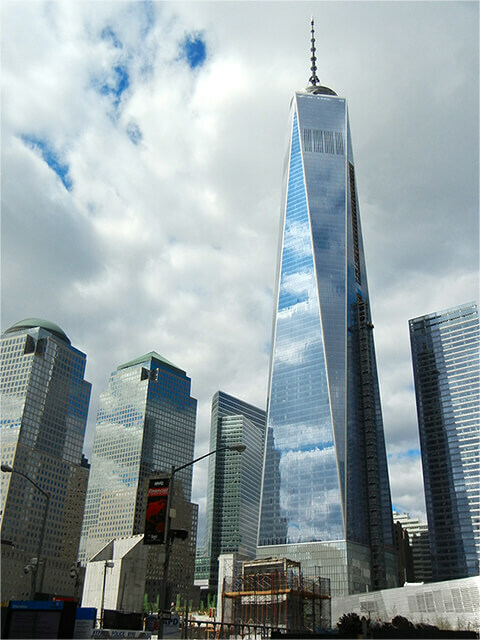 Martin Brattrud is specified by Gensler for one of the first installations in the new One World Trade Center, the new corporate headquarters for Condé Nast. Shown: Custom leather sofas by Martin Brattrud. Martin Brattrud introduces Medinah. 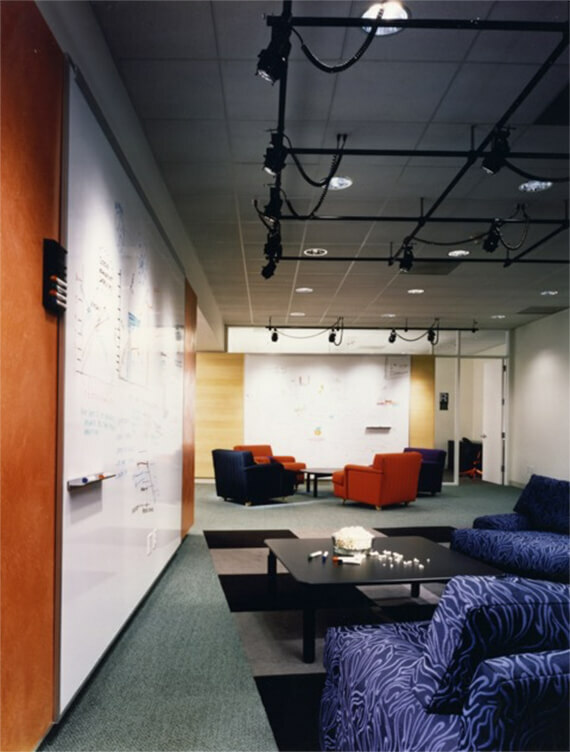 Designed as preconfigured applications, Medinah represents a new approach to simplifying space planning for open-concept environments.